Viewpoint - Kettle Yarn Co. When Dani Sunshine published her new design, Viewpoint, a few weeks ago my queue plans flew out the window. I knew I needed to cast it on in Islington Nori and Siren Call to wear for xmas. This elegant A-line sweater is knit in the round from the top down. The modified raglan yoke is worked in two colours. 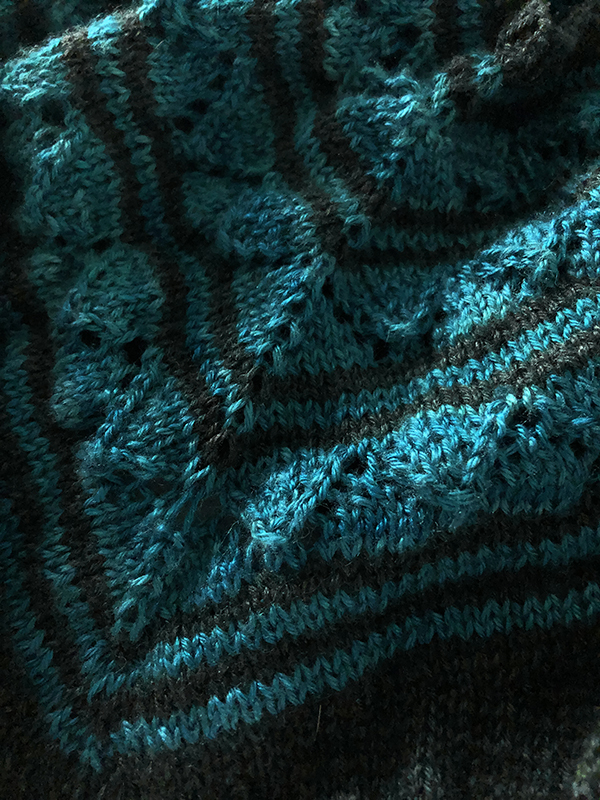 A simple lace pattern is worked on the front of the sweater yoke. The body and ¾ length sleeves are knit in stockinette stitch, in one colour, in the round; both are finished with twisted ribbing. I chose Islington for this as I knew the Bluefaced Leicester / Silk blend will be perfect for xmas parties! I chose Nori and Siren Call as I’ve been dying to put these two colours together since I created Nori. I can’t believe how smoothly and quickly this is knitting up. I am already halfway down the body and it has only been a couple weeks. Loving this colour combo and hoping to wear it for xmas dinner! Fingers crossed.